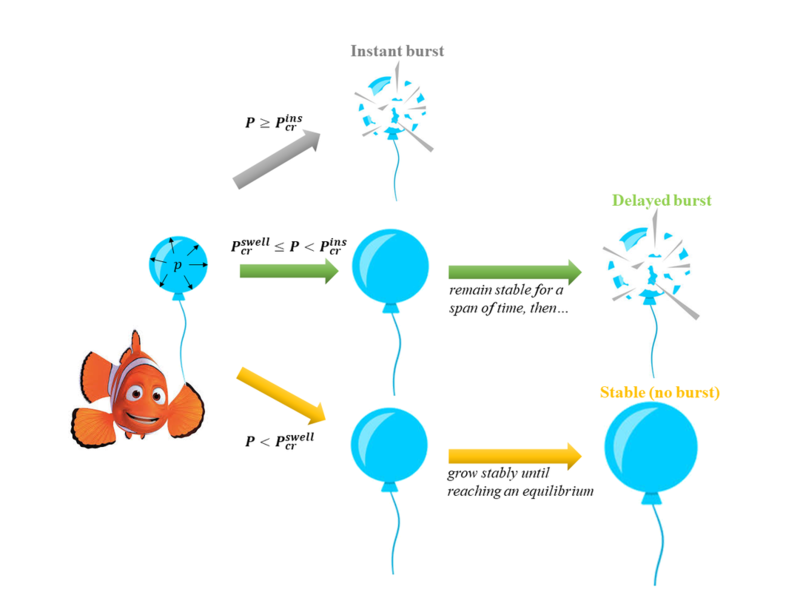 Will Nemo's balloon burst or not? Nemo lives in the ocean near the Great Barrier Reef. One day, he bought a hydrogel balloon which is inflated by an inner pressure p. Will the balloon burst eventually or stay safe? When inflating a rubber balloon, it is commonly concluded that a sudden expansion in balloon size (i.e. the burst) occurs once the inner pressure reaches a critical threshold, the instantaneous burst pressure. Such burst phenomena are usually attributed to the snap-through instability. In this work, we demonstrate that when a hydrogel balloon (just like Nemo's one) is subject to a subcritical pressure lower than the instantaneous burst pressure, the hydrogel balloon may remain stable for a span of time, and then burst suddenly. We refer to such burst phenomena as the delayed burst of the gel balloon. When subject to such a subcritical inner pressure, a hydrogel balloon slowly and continuously absorbs solvent and swells. We find the instantaneous burst pressure of the hydrogel balloon to be a decreasing function of swelling ratio. The criterion for the onset of the burst is that the swelling-related instantaneous burst pressure drops to the applied inner pressure. The delayed burst can, therefore, be attributed to the time needed for the hydrogel swelling to reduce the instantaneous burst pressure to the level of applied pressure. We further delineate a map indicating three distinct deformation modes of gel balloons, i.e. instantaneous burst, delayed burst, and steady deformation without burst (safe mode), in the parameter space of applied pressure and mechanical properties of the hydrogel. The delayed burst of a hydrogel balloon is counterintuitive and a crucial aspect in developing hydrogel-shell-based soft actuators and soft machines.